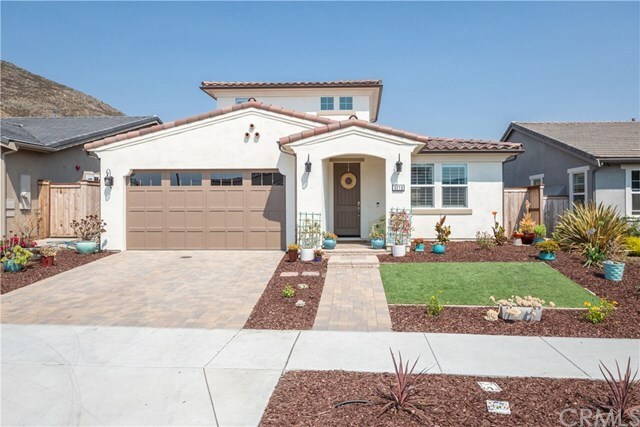 Gorgeous 2.5 year old Serra Meadows home! Featuring 4 bedrooms, 3 full bathrooms with first floor master suite, AIR CONDITIONING and leased SOLAR. Spacious and open concept living, great for entertaining both inside and outside. Beautiful 16" tile floors throughout main living area, gas fireplace with custom wood surrounding and mantel, upgraded Quartz counter tops with white cabinets with soft close drawers, stainless steel appliances, over-sized island with ample built-in storage and seating. Dining room with wall of windows and sliding glass doors overlooking the backyard patio, gas fire pit, low maintenance high-end artificial grass lawn with mature tropical landscaping and gorgeous views of South Hills!! Master bedroom with well appointed master en suite and views of the private yard and mountains, glass surround tile shower and walk in closet. All bathrooms have the same upgraded Quartz counter tops and white cabinets as kitchen. Upstairs bedroom with en suite and custom built loft, large enough for a single bed, play area or storage. 2-car garage with side access door to backyard. Information not verified. Owner Agent.